Hey there listeners–or, readers, in this case. I’ve decided to put together some supplemental information that didn’t have time to make it into our updates/would have bored you to tears to listen to for 45 minutes. So, these might have a chronological order or a logical order. Or it might just be relevant to what we discussed that week. As promised, my inaugural blog post is going to provide you some statistical information on Rose’s current state based on hiking norms and all that jazz. It’s not exactly the most riveting stuff, but that will be coming later. For now, I wanted to provide you with some background info that would have bored you to tears on the podcast. Who knows, maybe it’ll bore you to tears now, but you can’t say I don’t keep my promises. First things first, a girl in her late teens needs to be drinking nine cups of water a day. And that’s if you’re doing nothing but binge watching Netflix all day. Rose is a super athletic person which means basically everything going in her body is being used up a lot faster than the rest of us couch potatoes. But, if she was a good hiker, which we know she was, she likely prehydrated so she didn’t have to lug heavy amounts of water with her. Generally speaking, during the hike, you should be consuming a pint of water every hour and then finish off with a liter of water at the end of the day. Especially in the Arizona desert. Based on the police report of items missing from her room, she did take enough water bottles to account for that much water. Rose was prepared, so we can (hopefully) rule out dehydration. Rose brought supplies and likely knew of any watering holes in the area of her hike. She was also an expert at detoxifying the water since she pulled out this fancy kit one time in chem class that boiled water twice as fast as an open flame. She was something of a nut about things like that. But it worked in her favor. As for food? For a normal hike, 2,000 calories a day is the suggestion. But for more mountainous terrain, like the Superstitions, you need to bump that up to 4,500. This is especially true for someone like Rose whose metabolism probably runs at double the normal rate for a teenage girl. Again, according to the manifest of her items, she had several packs of granola, trail mix, and chia bars with her. Like I said, this girl was not just going for a Snow White walk in the woods to hang out with some wildlife, she took this seriously. Why is this important? Well I’m building you a character profile on our missing girl since in the next several blog posts we’re going to be departing a focus on Rose to look at the wilderness she’s found herself lost in. That’s a history that’s going to take several weeks to map out for you in detail. So for now, that’s some info on what we know about Rose’s preparations for her hike. 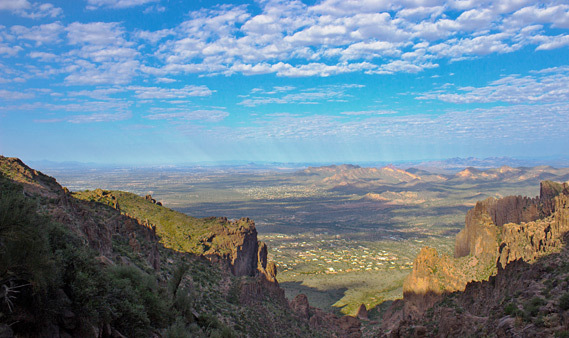 Next time I’m on here I’ll begin your newbie’s history to the very ominous world of the Superstition Mountains.